This might surprise some of you but I rarely make my own BBQ sauces. In fact I am bit of a sauce ho. I do make my own pulled pork sauce and my mustard sauce, but I generally use prepared sauces for other things. I have about a dozen open sauces in my fridge right now. Alexis picks up sauces (usually based on the names), I buy them at festivals, and I get people sending me samples. So the last thing I need to be doing is ordering sauces by mail. But that's what I did last week. I had been hearing so much about Shane Draper's BBQSmokin' Sauce from folks on the forums and BBQ circuit that I had to try it. I bought a bottle of the rub and sauce online and was amazed to receive it 36 hours later. Turns out Shane lives across the state line from us and was rushing to get his holiday weekend orders out so his customers would have them in time. The small sauce bottlers are all about quality and customer service. 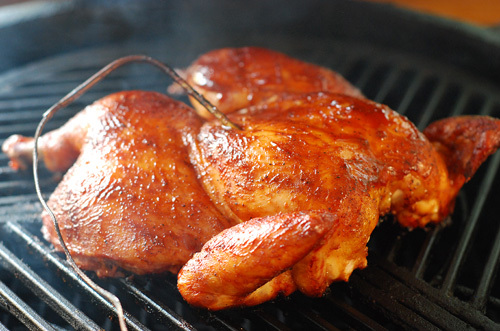 I tested the rub and sauce out on your average yard bird this weekend. I seasoned the spatchcocked chicken with a good dose of Draper's A.P. Rub. Then I gave the bird a little over an hour of “applied charcoal therapy” bone side down over a 325f fire on a raised grill grate (8-9” from the heat source). When the bird reached an internal temp of 150f, I brushed some straight Smokin' Sauce onto it and let it finish out to 160f. 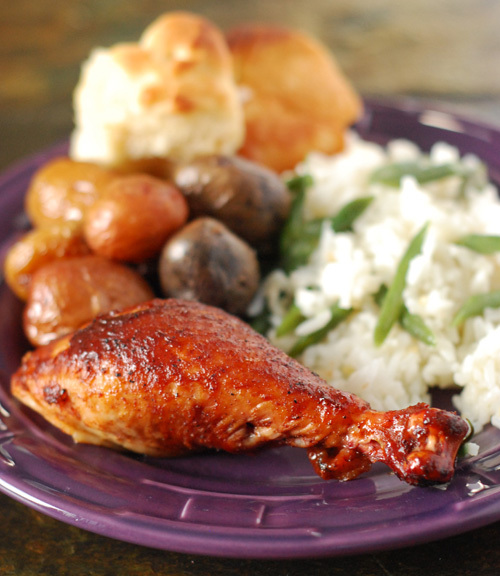 The aroma of the sauce cooked on to the chicken filled the house as I brought it in to rest. I didn't even have to call Trevor upstairs to come eat, the smell brought him down. The sauce's consistency is thicker than the vinegary Carolina style sauces but thinner than the corn syrup laden commercial sauces on your grocery store aisles. Cooked on to the chicken it was right where it needed to be. When I tasted the sauce by itself earlier, I thought it had too strong of a fruity and tomato flavor. But when it was grilled with the meat I think it had just the right balance of sweet, smoky, and a small bit of heat. I've also tried this on brisket and I liked it even better on beef. 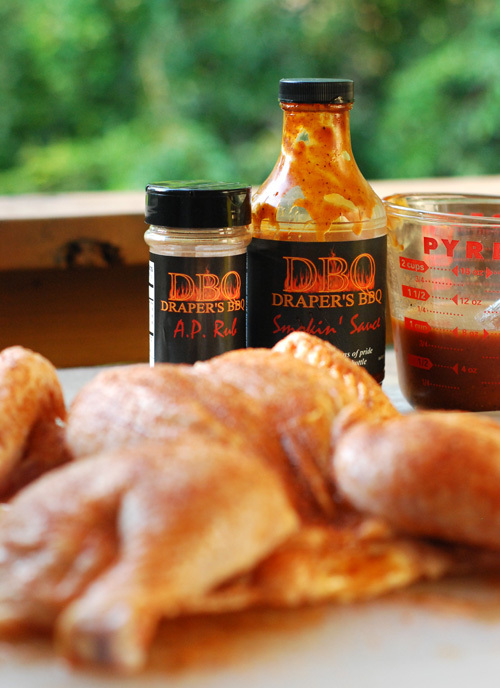 I can't say how Draper'sBBQ Smokin' Sauce and AP Rub will do used in a competition since that's not my gig. But it works great in the back yard. [Standard Disclaimer] blah blah blah, the usual. I have no affiliation and get no compensation from Drapers' BBQ and paid full price for the sauce and rub.